Each year we look to place some Dual Positions Players (DPP) throughout our team for added flexibility. 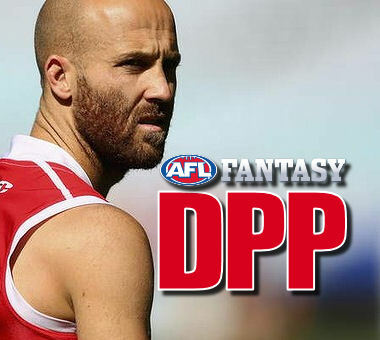 Here is the complete list of players available as DPPs in 2014 with their AFL Fantasy prices. PLEASE NOTE: If viewing this page on a mobile device such as an iPhone, turn it to landscape mode to see the whole table. Click here for table of all AFL Fantasy prices and positions for 2014. I have been tempted to pick Tom Mitchell in the forward line. I think he may become a really ball magnet in 2014 and could soon make it into the Calvin’s piggery. Like father like son. Sportsbets Fantasy footy is open for 2014. Not so many people have entered so it will be easy to win. The prize is $50.000 so it’s worth putting a team in, also it’s free to play. Thanks, Warnie. I think 2014 will the year of the DPP! I disagree Raymond, I think DPP will fade a bit in 2014. A lot less relevant DPPs in 2014 compared to 2013, especially in the R/Fs which I’ve found to be the most useful DP (along with M/F). DPP in DT is a thing of the past, in SC is a must. It has its uses from time to time – certainly helped me last season and I cant see why it wont again this year. I won’t be structuring my team around DPP this year. It was hella handy last season, but for what I gained for what I potentially missed out on wasn’t worth it. It is early in this pre-season, but with 44 trades, it isn’t necessary. Other games that will have limited trades, I will be looking closely. Shame there isn’t really a pair of RUC/FWD that I could use for those games. With your exalted status in the world of Fantasy AFL, do you have knowledge about the rules for DT in 2014 that lead you to be making such outlandish statements? Umm… no? Didn’t I just explain that with the whole 44 trades thing? That’s my simple reason why not. If there is a 50/50 call for me though, I will be looking at some DPP, but what I got out of 2013 is that it wasn’t too important with all of those trades. As for new rules, from my understanding, any changes don’t really change this statement/strategy. The DPP opportunity is still as strong with the 44 trades but the options we have in 2014 are way less than in previous years. If you check out my team on the My Team 2.0 page you’ll see that I have two DPP links in my midfield; one DEF/MID and one FWD/MID. Then in DEF and FWD there are a lot more DPP links to the midfield. I’m usually not too fussed about DPP but I have a gut feeling that this year, if you have two strong DPP links between positions, it will be handy when players do not play.